Relevance CRT0083914 is a novel non-carboxylate inhibitors of the aldo-ketoreductase enzyme AKR1C3, which is a target of interest in breast and prostate cancer and also some leukaemias. Selectivity Displays much weaker inhibitory activity against AKR1C1, AKR1C2 and AKR1C4 (IC50 >30 µM). 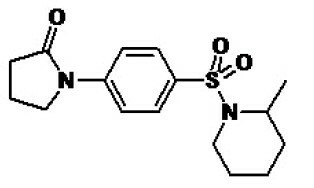 Notes CRT0083914: a series of (piperidinosulfonamidophenyl)pyrrolidin-2-ones as potent (<100 nM) and isoform-selective non-carboxylate inhibitors of AKR1C3. Structure–activity relationships identified the sulfonamide was critical, and a crystal structure showed the 2-pyrrolidinone does not interact directly with residues in the oxyanion hole. Variations in the position, co-planarity or electronic nature of the pyrrolidinone ring severely diminished activity, as did altering the size or polarity of the piperidino ring. There was a broad correlation between the enzyme potencies of the compounds and their effectiveness at inhibiting AKR1C3 activity in cells. Heinrich et al. 2013. Eur J Med Chem. 62:738-44. PMID: 23454516. Synthesis and structure-activity relationships for 1-(4-(piperidin-1-ylsulfonyl)phenyl)pyrrolidin-2-ones as novel non-carboxylate inhibitors of the aldo-keto reductase enzyme AKR1C3.